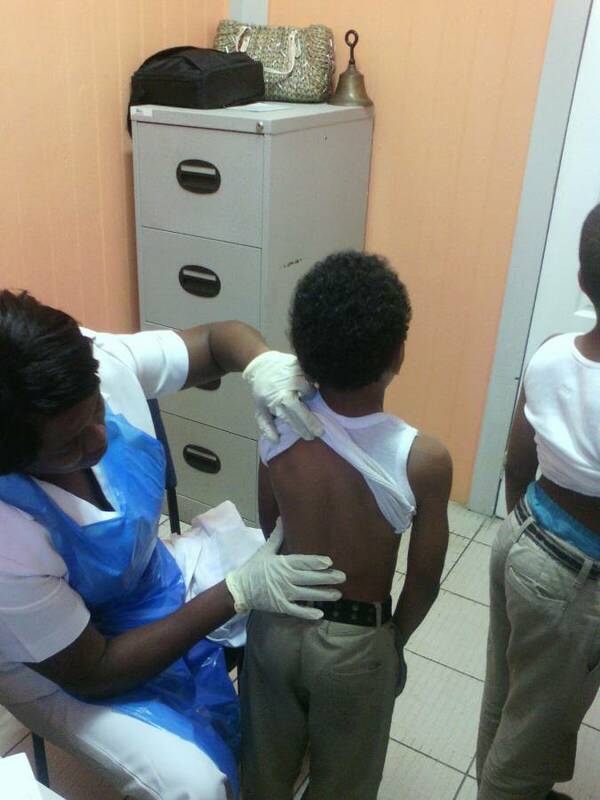 The Ministry of Health on Tuesday, 1 March 2016, screened over 400 students from the St George’s Anglican School (Hindsey), holding firm to its promise to evaluate students for Chickenpox before returning to the classrooms. Tuesday’s exercise saw a team of qualified nursing personnel conducting screening and evaluation of students at the St George’s Anglican Junior and Senior Schools. A total of 255 and 183 students from the Junior and Senior schools, respectively, were examined on the compound, as the institution reopened its doors following the completion of sanitation and cleaning operations. During Tuesday’s screening/examination at the school, several students with skin lesions, fever, cold, headaches and skin rashes were identified, and were not given clearance for a return to the classroom. Some of the students were referred to the doctor and others were requested to be observed at home. The Ministry will undertake a daily monitoring of the school, conduct education sessions with teachers, and undertake another medical evaluation of students, in particular the ones that are to be observed at home and referred.